Let’s be honest, there are a lot of zombie movies flooding the market and most of them are bad. Being based on a videogame has certainly not been a help to some of them…I mean House of the Dead and all…And now along comes Dead Rising: Watchtower based upon the Capcom series. Specifically, the film is set in between the events in Dead Rising 2 and Dead Rising 3. Of course if you haven’t played the games all of that is meaningless. While it doesn’t take intimate knowledge of the games to follow the film it certainly can’t hurt. Jesse Metcalf stars as Chase Carter, a reporter for an online news service. He and his camera woman Jordan (Keegan Connor) are reporting on a zombie outbreak in a quarantined section of a city in Oregon. The government has developed a vaccine for the zombie virus called Zombrex which keeps the virus at bay. However, an apparent new strain of the zombie virus is resistant to the drug and Chase and Jordan find themselves caught up in the chaos as citizens waiting for transfer out of the area suddenly become infected. Jordan manages to make it out before the gates are closed in the quarantined area but Chase finds himself trapped with the beautiful Crystal, who is infected and needs the virus to avoid turning, and with Maggie, a mother trying to find her daughter. The trio has to navigate through the city avoiding not only the zombies, but a ruthless gang of bikers who pillage the area for supplies. But when the Zombrex still seems to work on Crystal, Jordan unveils a government conspiracy at the highest levels. Now she has to help her friends get out of the quarantine zone before the military, led by General Lyons (Haysbert) can fire bomb the area. For fans of the series, Rob Riggle is along in the cast as Frank West, the hero of the first game. West is brought in on a national news program to offer his views as an “expert” on battling zombies. In truth, Riggle’s scenes are some of the best in the film. He is absolutely hilarious as the obnoxious guest shooting down every myth the media has about zombies. Fans will also appreciate that Director Zach Lipovsky has incorporated many of the gameplay elements into the film such as characters grabbing anything they can get their hands on to use as weapons like trashcan lids, bricks, road signs, as well as customizing weapons such as a combination sledge hammer and power saw…all the better to kill zombies with! The film does have some fun performances, especially from Riggle and Meghan Ory (Once Upon a Time) as Crystal. The zombies and gore effects are also done quite well and there are some inventive zombie kills. But the zombies are inconsistent with some of the Romero shambling variety and others moving at much faster clips seemingly dependent only upon the amount of peril in which the characters find themselves. 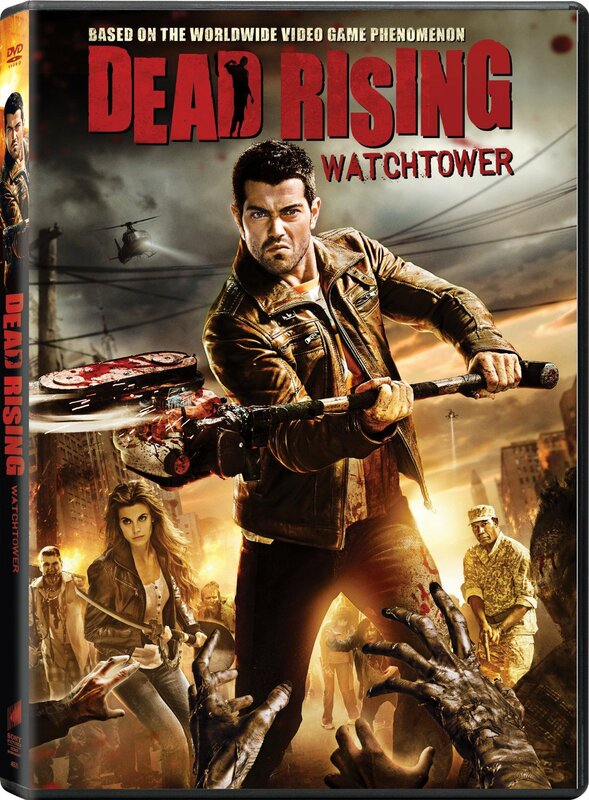 The main issue with Dead Rising: Watchtower is that at two hours it is a ½ too long. The film is densely plotted with its conspiracies, bikers, and zombies; In fact the zombies become third fiddle to these other threats. It’s just too long. It drags for stretches and settles into a pattern where the characters flee, fight zombies, and find a place to hole up before repeating the process again. Even worse is that the film is left open ended at the conclusion, presuming a sequel. It was ok…it wasn’t sequel necessary ok.